This is an idea I've been wanting to implement for over a year. With the Spring Cleaning project I am finally getting to it. This box is to make my life easier and to help me get to paint touch-ups faster & more easily. 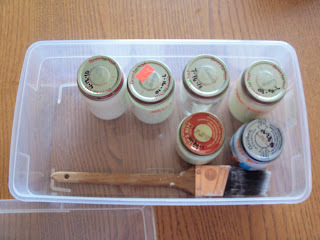 It contains baby food jars with paint for various rooms of my house and a small paintbrush. Next time I need to touch up paint I can just grab this off the pantry shelf and quickly fix the problem spot. Previously I would have to head out to the garage, dig through a dozen gallon paint cans, find the correct paint, can opener, stir stick & brush, pry the lid off & stir, then touch up the paint. Of course, then I'd have to find a hammer to put the lid back on and put the paint & tools all back to the garage . . . eventaully. The putting it away usually takes me several days, sadly. I am hoping this little box helps!